Here at Sargent Choice we love desserts just as much as the next person. It’s our goal to create delicious items that also are healthy for you. Tasting excellent is extremely important, while adding solid nutrition to your meal. Unlike most cupcakes which are made with refined flours, sugars and oil, these are light, sweet and filling thanks to the addition of a secret ingredient…. Dates!!! “Nature’s Candy” Dates provide a rich sweetness, while adding fiber to this recipe! Give them a try-we guarantee you won’t miss your old cupcake recipe! Bring water and chopped dates just to a boil in a heavy saucepan, then transfer the mixture to a food processor. Add cocoa powder and chocolate, pulsing 1-2 times to combine. Let cool 2 minutes, and then add brown sugar, egg, vanilla, baking soda, and a pinch of salt, then puree until smooth. Add flour and pulse just until incorporated. Prepare muffin tins with paper liners or spray with cooking spray. Spoon batter into cups, dividing it evenly, and bake in middle of oven until a wooden pick or skewer comes out clean, 20-23 minutes. Cool cupcakes in pan on a rack 10 minutes, then turn out onto rack and cool completely, right side up. While the cupcakes are baking, melt white chocolate chips in a microwave safe bowl, for 20seconds at a time, stir until smooth. 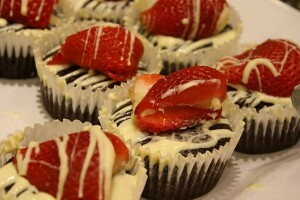 Drizzle white chocolate over cooled cupcakes and top with half a strawberry. 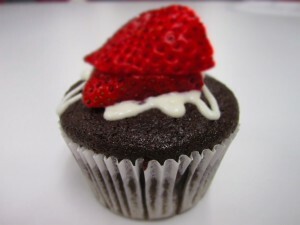 1 cupcake has 200 calories 3g of fiber and 6 g of unsaturated fat. Enjoy this deliciously healthy treat! What is your favorite type of cupcake or dessert?